Mojave Desert, April 18, 2003: In the early morning hours, before the intense heat set in on the desert floor, the hangar doors swung open to reveal yet another strange craft with the obvious signature of the designer. 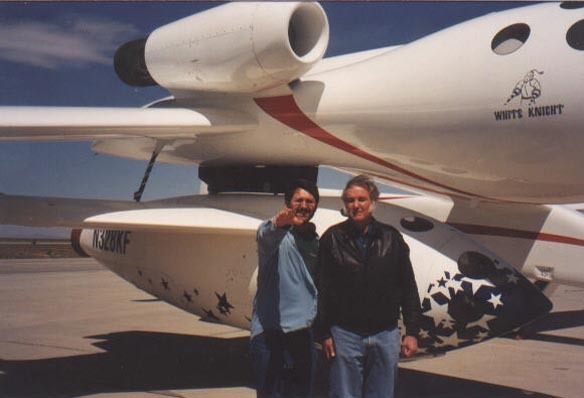 Burt Rutan, President of Scaled Composites, had just launched “The First Private Manned Space Program” with the unveiling of SpaceShipOne, the vehicle that will carry three persons into space. The story really began several years ago. In 1998, Burt and Tim Pickens of Madison, Alabama, met in Huntsville at an AIAA event. This meeting ultimately resulted in Tim’s relocation to Mojave and his employment as lead propulsion designer for this historic project. From napkin sketches with Burt in Huntsville to what you see today in Mojave, the propulsion concept was very much rooted in the Rocket City. 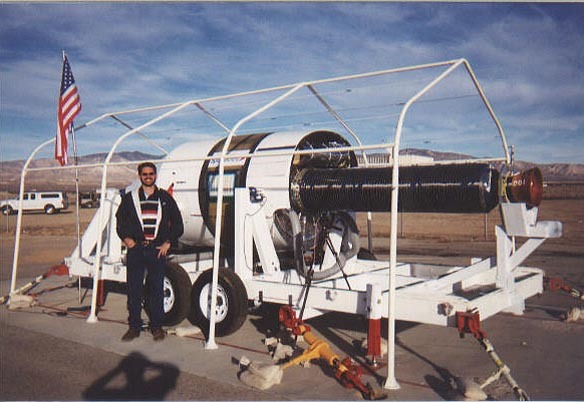 Working at Scaled, Tim’s responsibilities included the development of main and RCS propulsion systems, nitrous oxide portable fill station, motor test stand, and propulsion fluids and pressurization. Initially, Tim was expected to lead an entirely in-house hybrid motor design, but this plan was later revised. Two hybrid motor vendors were selected to handle the fuel pouring, injector/valve design and engine controller. This situation served the dual purposes of reducing Scaled’s workload, and decreasing costs. This approach also allowed Scaled to focus on such complex issues as designing the motor, case and nozzle (CTN). SpaceShipOne was a suborbital air-launched spaceplane that completed the first manned private spaceflight in 2004. That same year, it won the US$10 million Ansari X Prize and was immediately retired from active service. Its mothership was named “White Knight.” Both craft were developed and flown by Mojave Aerospace Ventures, which was a joint venture between Paul Allen and Scaled Composites, Burt Rutan’s aviation company. Paul Allen provided the funding of approximately US$25 million.